I’m going on a cruise to the caribbean till August 8th. If the American economy is ruined on August 2nd maybe I’ll just stay down there and bartend on some beach for the rest of my life. Here’s some reading to keep you busy while I’m away. Questioning a claim is often the best way to establish its truth. Arnold Kling thinks this David Leonhardt claim is a sentence that should be questioned. So what’s the counterexample that Kling advances? The internet. Now, I know I sometimes feel like I live online, but if a computer network is the best counterexample of a successful market economy without “a significant government role” you may have just proven Leonhardt’s point. Another likely factor is that American conservatism is a fundamentally populist movement, and the inflation hawks’ position has a simplicity that makes it intuitively appealing, especially to a movement that tends to see all policy issues in terms of virtue. Rhetoric about “printing money,” “debasing the currency,” and so forth are not only intuitively appealing, they also dovetail nicely with broader conservative themes of thrift and self-control. 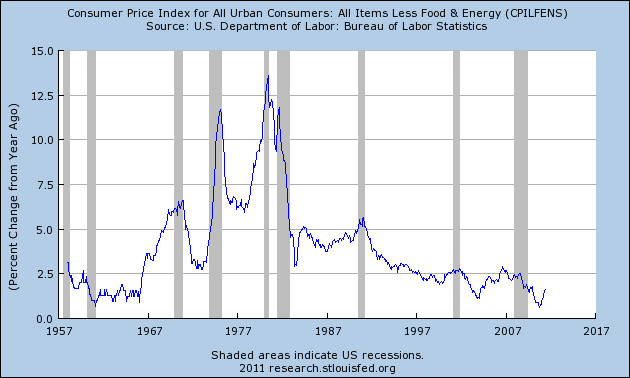 The arguments of inflation doves are more subtle and lack the same kind intuitive appeal. His other is that conservative and libertarian thinkers are intellectually stuck in a 1970s mindset when inflation was a problem. Similarly, I’ve always wondered why conservatives and libertarians often resist the fact that the planet is warming and the overwhelming evidence that mankind is contributing to climate change. Many conservatives have strong religious convictions that lead them to believe that God would never allow global warming, but that can’t explain all of the stubbornness. Lee leaves out one potential answer on inflation. The Right generally looks out for the interests of the rich and even though inflation could alleviate unemployment it would hurt the wealthy. It’s not that hard to believe that many conservatives don’t “believe” in global warming because corporate backers like oil companies don’t want them to “believe” in it. Yet, I still don’t think that explains the whole story. I have no doubt the the Koch brothers, for example, frequently influence politicians and think tanks that take their money, but not every libertarian or conservative is a corporate hack. Progressives shouldn’t act as if that’s the case. Just as low inflation causes cognitive dissonance for conservatives’ ideological commitment to “virtue” and “thrift,” solving global warming challenges anti-government dogma. Libertarian and conservative ideology demands that government can’t solve problems and market forces can. A huge negative externality such as climate change requires government intervention. As easy as it may be for many right-wing pundits to refuse to be bought, it is much more difficult to accept reality when it means changing one’s mind. It’s not as if I switched the labels on the graphs at the top of this post; we all can look at the same facts. But it’s easier to deny the world than it is to alter a worldview. Within two months of Obamacare’s passing, the recovery stalled. Figure 1 shows net private-sector job creation from January 2009 onward. The red line shows the trend in job creation before and after April 2010. Private-sector job creation improved by an average of 67,600 jobs per month before April 2010. That month, private-sector employers added 229,000 net jobs. As Sherk admits, this is only a correlation not causation but, he writes, “the fact does lend strong weight to the voices of businesses who say that the law is preventing hiring.” It seemed to be at least suggestive evidence of the “policy uncertainty” theory. 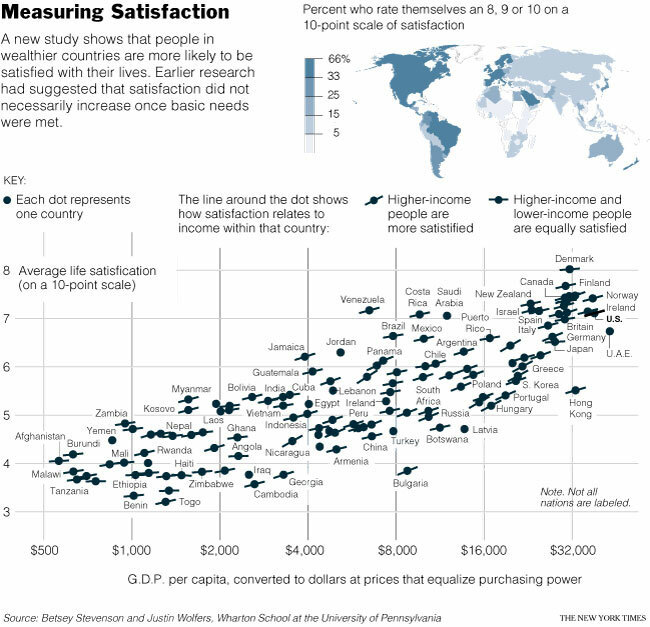 Yet, my skepticism led me to think about this graph a bit further. Notice that before around January of 2010 the line graph dips below 0. Although the “trend in job creation” is upward, what that graph actually shows is the economy is losing private sector jobs just at a slower rate from earlier months. Former Bush advisor, Keith Hennessy, had previously criticized Austan Goolsbee for a similar tactic with arrows. (I discuss that video here) The Heritage Foundation even approvingly links that video so they understand what they’re doing. 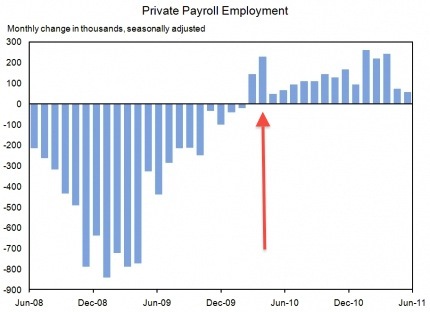 If you instead look at this bar graph of private sector job creation you can see more clearly what’s going on. I’ve added in an arrow for April – the month that supposedly shows the beginning of the lower trend for job creation due to Obamacare. But now we see that after Obamacare passed we were gaining jobs while before it we were losing jobs. I’m certainly not claiming causation. I’m merely pointing out the obvious fraud that James Sherk and The Heritage Foundation are trying to get away with here. [update July 22]: A few other bloggers have noticed them same thing I did about Heritage’s deceitful report. Their pieces are worth reading too. Funny enough, I actually checked all these blogs when I was first sent the Heritage link. Glad they joined the party to expose the propaganda. [update September 13]: I’m happy to see that this post has been cited frequently in numerous online forums. Unfortunately, I’ve noticed that some confusion continues around the change in “trend” in private sector employment before and after the passage of Obamacare. The trend cited by Heritage is purposefully misleading; we were not gaining an average 67,600 before April and then 6,400 afterwards. Repeat: Net change in jobs is not the same thing as job growth. I looked up the private sector job numbers for the dates in the graphs (Jan ’09 – Jun’11) and calculated the average monthly change in private sector employment before and after Obamacare, which is what everyone seems to think the Heritage graph shows. Before Obamacare the monthly change in private sector employment was an average of about -326,000 jobs a month. That’s NEGATIVE 326 thousand. After Obamacare the monthly change was an average of +114,000 jobs a month. That’s POSITIVE 114 thousand. How’s that for a changing trend? Steven Davis, economics professor at the University of Chicago, writes in Bloomberg why he thinks “Employers Are Slow to Fill Jobs.” Davis goes through a number of different theories and all probably play some role, but this paragraph caught my attention. 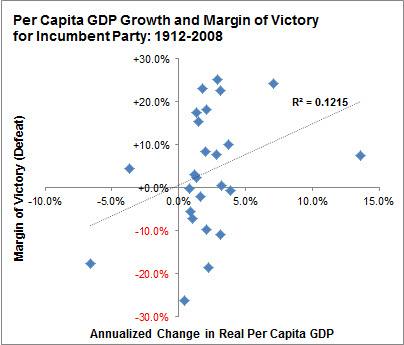 Another part of the explanation involves broader economic conditions. The same concerns about weak sales and an uncertain economic outlook that depress job creation also undercut the desire to fill openings. We live in a time of extraordinary uncertainty about government policy with respect to taxes, health care, financial regulation, monetary issues, environmental regulation, and other areas. The political impasse over the federal debt ceiling further muddles the outlook. Policy uncertainty discourages investment, job creation and hiring. As I’ve discussed, most of the evidence seems to point to “weak sales” as the most direct reason businesses aren’t hiring more workers. But, we keep seeing this focus on “policy uncertainty” from right of center commentators – a topic I’ve discussed frequently. Tying political uncertainty to the debt ceiling is interesting for this ongoing argument for a number of reasons. It provides a seemingly clear and dramatic case of policy uncertainty, but if the debt ceiling is raised we’ll have a distinct before-and-after. Are proponents of the political uncertainty argument willing to predict how big an effect this will have on job creation? I’m not willing to say it’s zero, but if I had to guess it’s probably very low at best. If they’re not willing to forecast a noticeable upward shift in the trend of hiring after this uncertainty is resolved, why do they continue to devote so much energy to the argument? It demonstrates the emptiness of Republican lawmakers that pushed the “policy uncertainty” theory. If they really believed their claim, why would they be so willing to create more uncertainty? I realize I may be contradicting my first point a bit, but what counts as evidence for policy uncertainty? Proponents of this theory love to claim that employers are deterred by uncertainty, but the bond markets haven’t even begun showing signs of concern. If investors aren’t changing their activity much, what makes anyone think employers are? It’d be easy for me to use Davis’s argument to hammer the GOP as harming job creation by causing uncertainty over the debt ceiling, but I don’t see any evidence for it. The real danger is what happens if the debt ceiling isn’t raised, when policy uncertainty turns into market panic. Once that happens we won’t be talking about why business are slow to fill jobs, but how stupid we were to push ourselves back into recession. 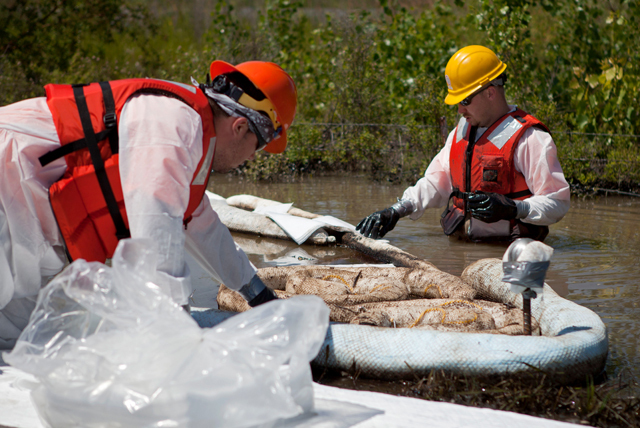 Now that ExxonMobile has spilled an estimated 42,000 gallons of oil into the Yellowstone River, I wonder how Palin and friends will blame environmentalists. I’m waiting till they claim that the “speed” of mitigating this disaster proves that we should open up more pristine environments to oil companies.